Bringing world cinema to a common platform for global recognition, the Academy Awards is the most coveted accolade worldwide. The Oscar statuette has stood the test of time in the mantels of the greatest filmmakers of the world since 1929. The first Academy Awards ceremony was organised on 16 May 1929 at the Hollywood Roosevelt Hotel, USA, away from the public eye. It included only 270 guests and the tickets amounted five dollars. It was a formal ceremony for 15 minutes as the winners were already declared three months in advance. William Wellman’s Wings based on World War 1 was the first film to bag the Academy Award in 1927. This silent film starring Clara Bow and Charles Rogers was screened at the awards ceremony with a live organ as its background score. Grand Hotel which won in 1932 was a classic with a stellar cast headed by Greta Garbo, John Barrymore, Joan Crawford and Lionel Barrymore. Set in Berlin’s famed Grand Hotel the film directed by Edmund Gould recounts the story of five guests whose fates intertwine climaxing in a murder overlooked by the apathetic public. It is the only film till date to have won the Academy Award for the best picture. Some of the few classic Oscar-winning movies that become milestones in film history are Gone with the Wind, Rebecca, How Green was My Valley, Casablanca, All about Eve, From Here to Eternity, On the Waterfront, Ben Hur, Lawrence Of Arabia, Dr Zhivago, My Fair Lady, West Side Story, Man for all Seasons and the list goes on. The Oscar statuette designed by Cedric Gibbons is the image of a knight with his crusader’s sword standing on a film reel. There are five spokes on the reel, each representing the branches of the Academy — writers, technicians, producers, actors and directors. However, it is a pity that two of the masters of world cinema, namely, Alfred Hitchcock and Charles Chaplin never received the award they so deserved. In 1972 Chaplin was given a 12 minute standing ovation, the longest in the Academy’s history. The irony is that though Hitchcock’s Rebecca won best picture, the Oscar somehow eluded him when it came to his exemplary direction. Speaking about the Indians who have brought honour to the country, Bollywood’s music director AR Rahman held two prestigious golden statuettes of Oscars for the best original song and the best original score in Slumdog Millionaire in 2009. He may be deemed the only living Indian to ever lift two Oscars singlehandedly. In 90 years history of the ceremony, five Indians have so far won the Academy Awards in different categories. Much before director Satyajit Ray was bestowed with the award for lifetime achievement in the category of best Indian cinema in April 1992, the first Oscar came to India through Bhanu Athaiya in 1983 for the costume design in Richard Attenborough’s Gandhi. Coupled with filmmaker Gulzar who received an award for the lyrics of the best original score, Resul Pookutty won an award for sound mixing in Slumdog Millionaire. 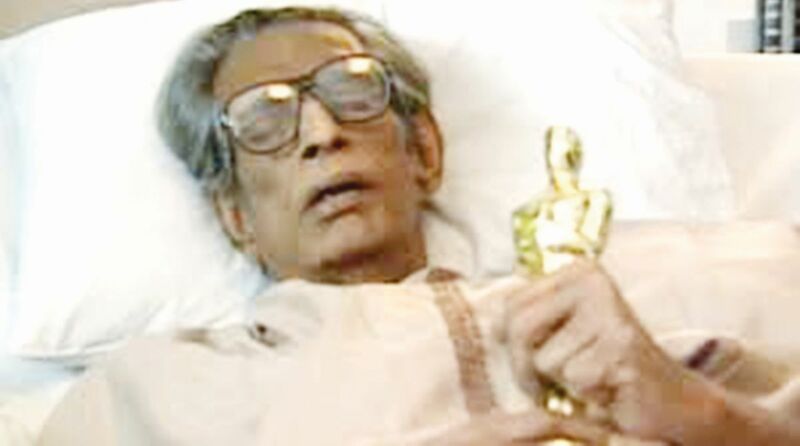 More than two and a half decades ago, Ray was presented the Oscar on his deathbed in Kolkata by the Academy Awards team members headed by the famed Hollywood actress Audrey Hepburn. It came as a rare honour to Ray for his contribution as an exceptional director whose films share the same global platform with icons like Ingmar Bergman, Cecil B DeMille, William Wyler, David Lean, Fred Zinnemann and Hitchcock among others which left a significant mark on world cinema. The announcement came as a bolt from the blue probably to sympathise Ray’s last days. This award is deemed as the pride of Bengal for the man who put Bengali cinema squarely on the world map.